An unidentified man ran amok and attacked shoppers with a bolo inside the Gaisano Mall in Malaybalay City, Bukidnon on Sunday afternoon. According to Christopher Velez, who uploaded a video on Facebook, the incident happened lunchtime at around 12:20 p.m. on October 16. 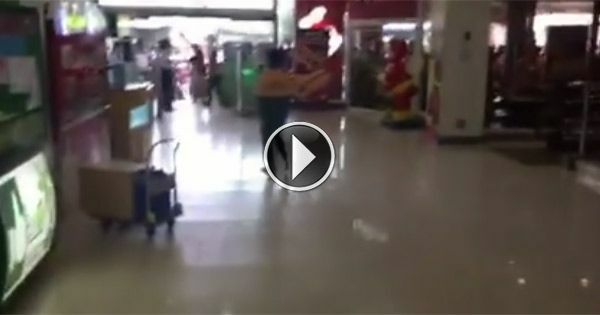 He said a guy wearing a yellow-green vest went berserk inside the busy shopping center. He said the reason behind the man's uncontrollable behavior is yet to be known. In the video, the man is seen alighting from the escalator bringing a bolo with him. When he reached the lower floor, he tried to hack someone but mall security guards and some police officers responded and stopped him. The staff had a hard time controlling the crowd as onlookers were coming near the scene and took videos on their smartphones. Velez' video has gone viral, garnering more than 4,000 shares and over 100,000 views in less than three hours after it was uploaded.